Baguette slices are topped with cream cheese, thin slices of prosciutto, figs and arugula, in these quick and easy appetizers. Place bread slices in single layer on baking sheet. Broil, 4 inches from heat, 2 to 3 min. on each side or until lightly toasted on both sides. 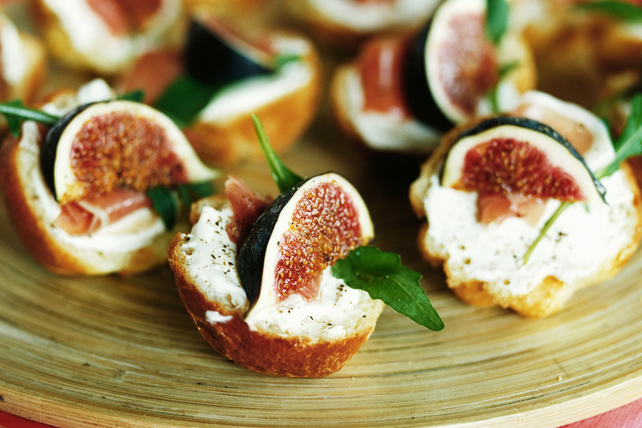 Spread toast slices with cream cheese product; top with prosciutto, arugula and figs. Substitute 4 fresh apricots, each cut into 6 slices, for the figs.